Verbatim CD-R media is tested and certified by leading drive manufacturers. These high-grade discs deliver reliable recording even at blazing drive sp..
Advanced Super-Eutectic Recording (Advanced SERL) technology, a Verbatim patented phase-change recording layer enhances archivability for superior dur.. Since its foundation Verbatim has been at the forefront of the evolution in data storage technology. 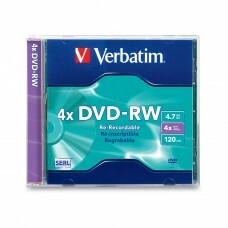 Today Verbatim remains one of the most recognizab..
Verbatim DVD-RW Matt Silver 4.7 GB, 4 xLightScribe	NoType	DVD-RWPrintable	NoDuplex (double-sided)	NoOptical disc diameter	120 mmMaterial	Polycarbonate..